These Spicy Salmon Poppers are a delicious, nutrient-dense, and ultra low-carb appetizer, snack, or meal option! Made with wholesome and straightforward ingredients, this is an essential recipe to have on-hand for family gatherings, work events, and tailgating parties! Like that of my Chicken Bacon Ranch Poppers, these Spicy Salmon Poppers are sure to impress anyone who tastes them, regardless of whether or not they are personally concerned with their carbohydrate intake! This recipe is easy to prepare, diet-friendly, and allergy-friendly, making it a great dish-to-pass choice for those parties you’re planning or events you’re attending. These Spicy Salmon Poppers are full of delicious flavor yet only require simple, straightforward ingredients that are both satiating and nutrient-dense. Full of healthy fats and protein, yet low in carbohydrates, a serving of this snack will keep you full and focused, without any of the bloated discomfort that high-carb foods tend to cause. 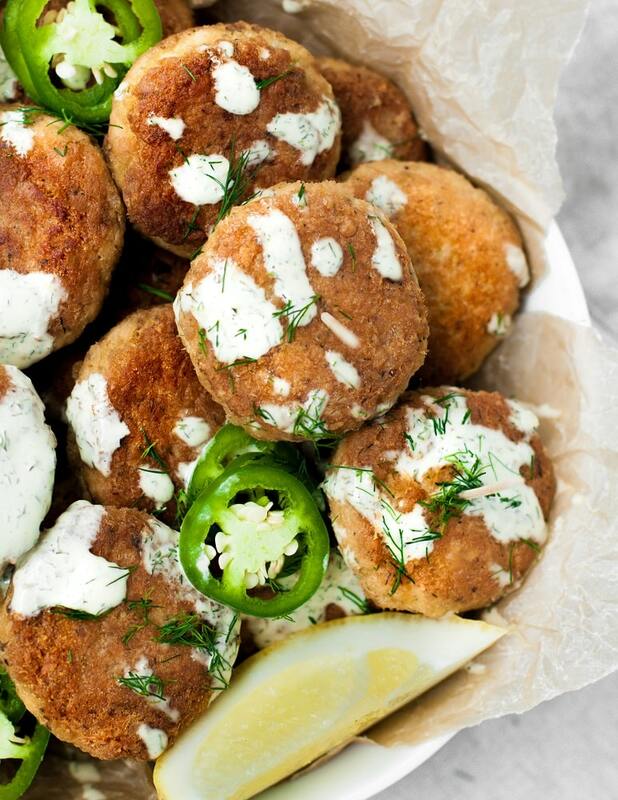 The pairing between the spiciness of the Spicy Salmon Poppers and the fresh, creaminess of the Lemon Dill Aioli in this recipe is a match made in heaven! Aiolis are simple mixtures of mayonnaise and garlic and can be easily transformed into an excellent dip, sauce, or dressing to add to your favorite recipes. 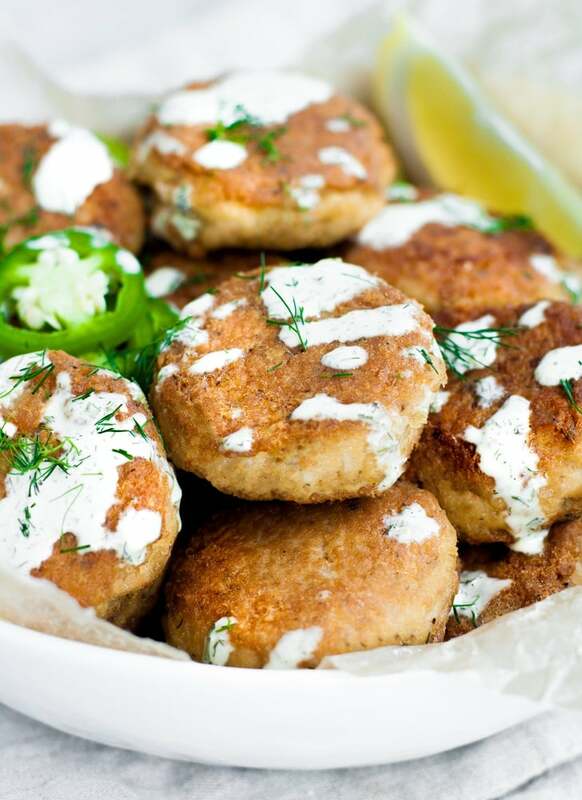 Aiolis contain a high content of healthy fat, minimal carbohydrates, and are dairy-free, yet taste creamy like ranch or other comparable dips and dressings. 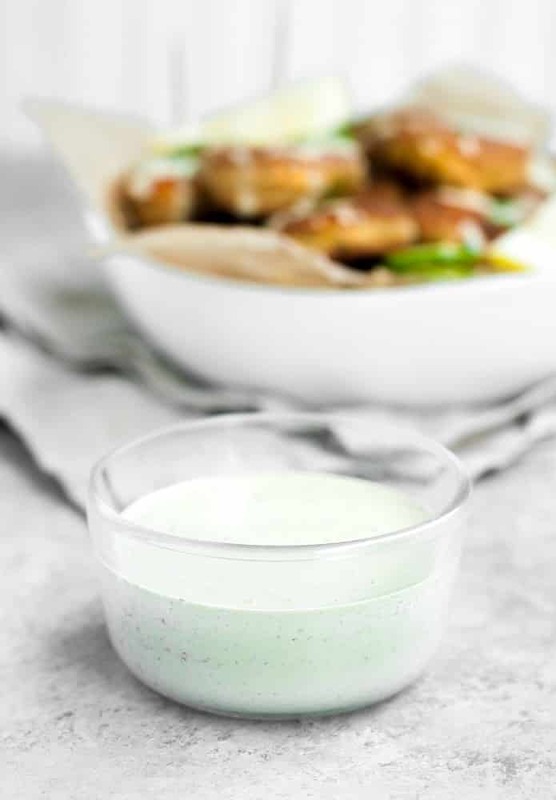 I love to have this Lemon Dill Aioli recipe prepared and on-hand to add to all of my favorite low-carb meals for an extra boost of flavor! 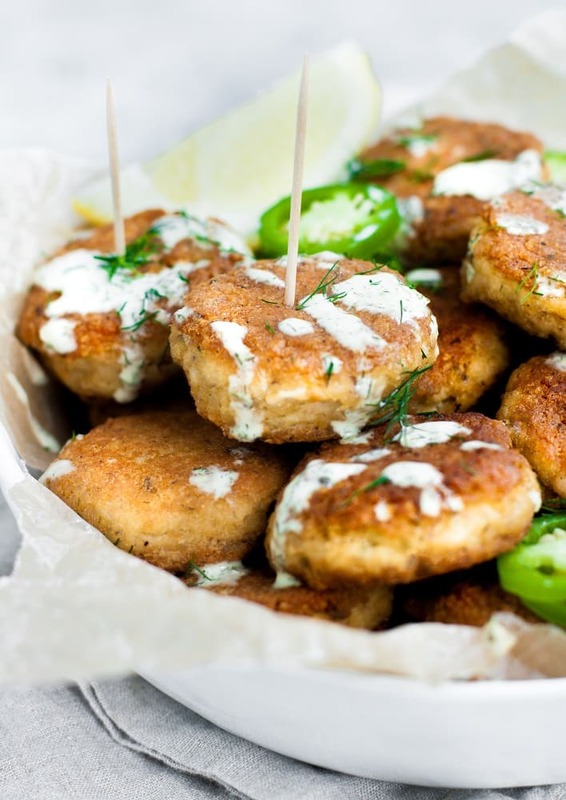 These Spicy Salmon Poppers with Lemon Dill Aioli are both diet- and allergy-friendly and are a great option to serve at parties where guests with a variety of diet requirements are attending. 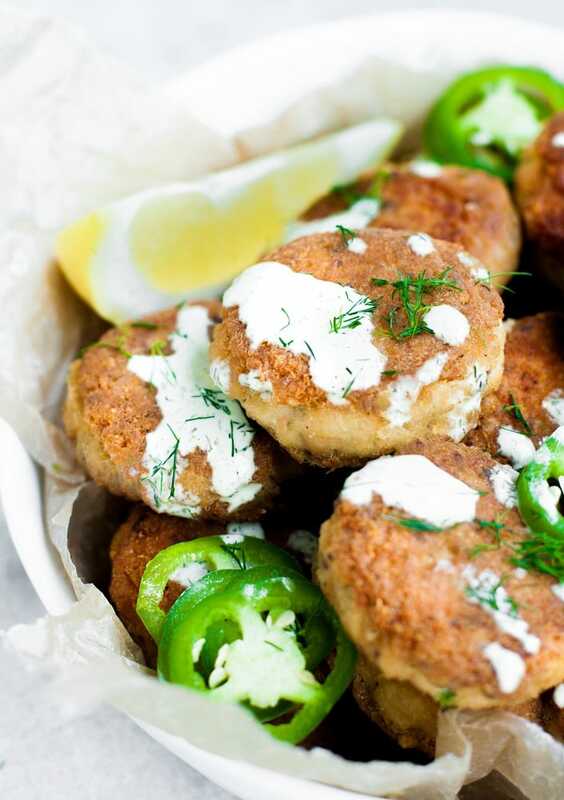 Keto and Low-Carb: These Spicy Salmon Poppers are ultra low-carb and keto-friendly! One serving (4 poppers) with aioli contains only 1.2 grams of net carbs! Dairy-Free: Both the poppers and the aioli are free from any ingredients containing dairy or lactose. Nut-Free: This recipe is entirely nut-free and is safe to consume for those with nut allergies or nut intolerances. Paleo and Whole30-Compliant: This recipe is free from gluten, grains, dairy, soy, and added-sugar, making it both paleo- and Whole30-compliant. Sugar-Free: This recipe does not include any added sugar. 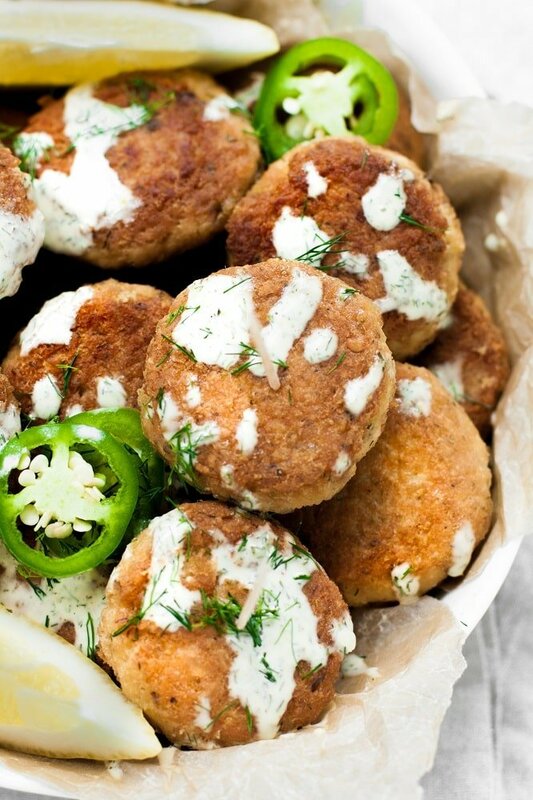 These Spicy Salmon Poppers contain only 1.2 grams of net carbs per serving! The recipe yields 24 poppers and one serving is considered as including 4 poppers. 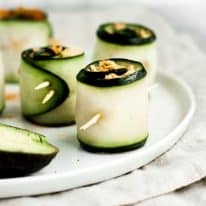 This recipe is keto, low-carb, dairy-free, nut-free, paleo, Whole30-compliant, gluten-free, grain-free, and sugar-free. Find more Real Balanced paleo recipes here. 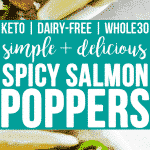 These Spicy Salmon Poppers are a delicious keto-friendly and Whole30-compliant meal option or party appetizer! 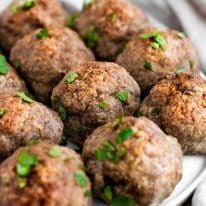 This recipe is keto, low-carb, dairy-free, nut-free, paleo, Whole30-compliant, gluten-free, grain-free, sugar-free, and contains only 1.2 grams of net carbs per serving! To a mixing bowl, combine all popper ingredients excluding avocado oil using hands or electric mixer. Form into 24 equal size balls* and gently press flat. Over medium heat in a pan, add avocado oil. Once oil is hot, add 4-6 poppers to pan and cook on each side until golden brown, about 4-5 minutes. Continue until all poppers are cooked. For the aioli, to a small bowl, add all ingredients and stir until well-incorporated. 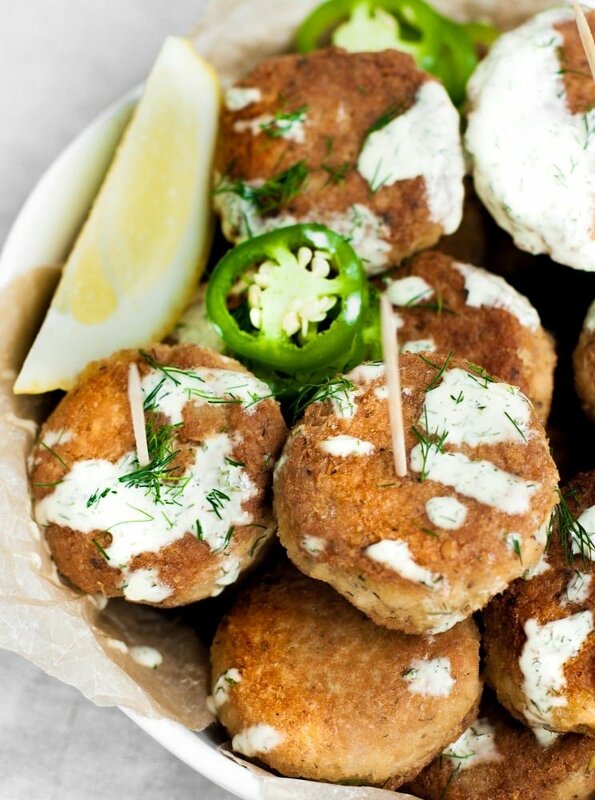 Serve poppers hot with aioli on the side or drizzled on top. Add optional garnishes as desired. * My poppers weighed approximately 40g each. Hi! 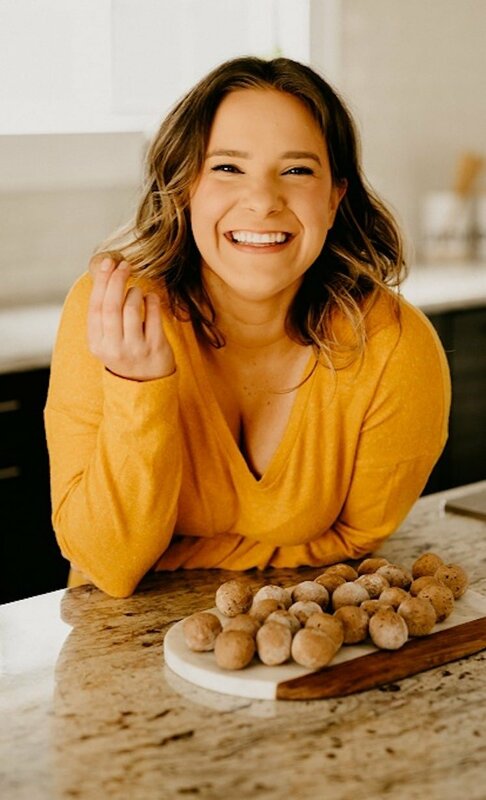 Is there anything keto that I can substitute for the pork rinds? Thank you! Hi, Ariella! I haven’t personally tried this, but I know that people have tried substituting in almond flour for pork rinds. Also, I have heard that people have success with crushing up fried chicken skins as a substitute for crushed pork rinds. Like I said, I haven’t tested either of these methods, so I cannot say with certainty that it will work. Is the measurement for the pork rinds 3/4 cup for them crushed or 3/4 cup whole? 3/4 cup crushed. 80g total. How do you get the Nutrition facts for a new recipe? Do you mean for this recipe? The nutrition label is below the recipe instructions. For this particular recipe, one serving (4 poppers + aioli) contains 441 calories, 30.7g fat, 1.4g total carbs (1.2g net carbs), and 39.8g protein.